From the time of its launch, WhatsApp is undoubtedly the top performing messaging app in its class. Like all other social messaging applications, anybody can connect with you anytime. On WhatsApp, you just need the contact number of the other person to get connected with him. You never have to wait for the request approval from the person, to whom you wish to get connected. Due to this simplicity of the process, there maybe some times when you feel irritated by any unwanted act from other WhatsApp user. To keep the WhatsApp users on the safer side, this messaging app is bundled with a very easy to use Block User option. Today, we are going to discuss each and every aspect about How to Block Any Contact or Group on WhatsApp. Not only by any individual WhatsApp contact, you may get irritated by your’s introduction to any WhatsApp group. Sadly 🙁 , this process is never under your control. You only have the option to Mute or Exit the WhatsApp group. Reporting the WhatsApp group as SPAM will never reduce your pain for getting disturbed without any reason. In simple words, these intruders are the serious threat for your privacy, let’s move forward to learn about throwing all of them out of our WhatsApp profile by blocking them. No matter if the culprit person is you friend, relative or colleague, the process of blocking WhatsApp user will remain the same for everybody. Before wasting any more precious second, Let’s move to the actual doings. 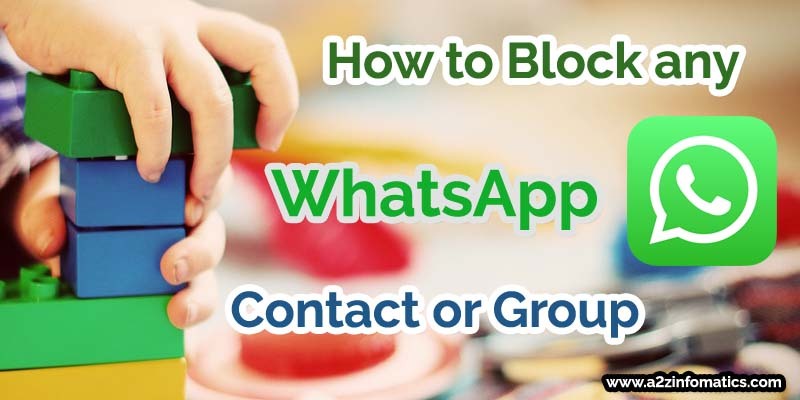 Below is the complete how-to tutorial about how to block any WhatsApp contact or WhatsApp group. To tell you the truth, at present no direct or official way available to block any WhatsApp group. Don’t worry, we had discovered our own working way to block the culprit WhatsApp group. Keep reading this blog to the end, many hidden secrets will get revealed today. You may like: How to Bold, Italic, Strikethrough Message Text in WhatsApp. How to Block any Person / Contact on WhatsApp. Actually there are two ways about how to block any individual on WhatsApp. Don’t worry we are going to demonstrate the both ways, although in general the both gives the same end results. Below we start with the first option following the second one. How to Block any Person / Contact on WhatsApp using the Privacy Settings. Before opting / using this option to block any WhatsApp user, make it sure that the person resides in your phone’s contact book. Below are the easy to understand steps to perform this act. 1)- Open WhatsApp messaging app. 2)- Now, look for the option menu ( 3 vertical dots at top-right). Just click it. 3)- From the option menu, Tap / Click the “Settings” option. 4)- On the “Settings” screen, Click to the “Account” option. 5)- On the “Account” screen, Click to the “Privacy” option. 6)- On the “Privacy” screen, look for the “Blocked contacts” option under “Messaging” section. 7)- Now, Tap / Click to the “Blocked contacts” option. 8)- Now, look for the “add people to the blocked list” icon at top-right on “Blocked contacts” screen. 9)- Once you click that icon, it will take you to the phone’s contacts book, select the culprit contact and that’s it. Congo !, You have successfully blocked the culprit person / contact on your WhatsApp. Fell comfortable, from now onward you will never get disturbed by the blocked WhatsApp user. 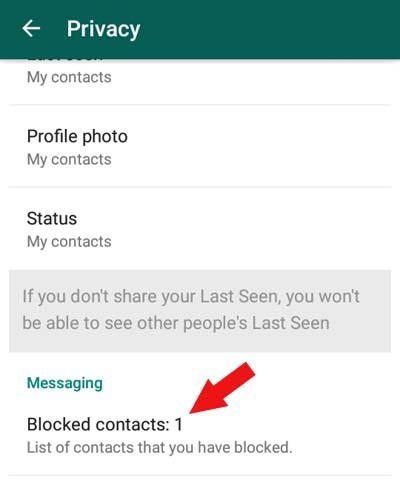 In case, you need to unblock the blocked WhatsApp contact / person, Just place yourself to the Options > Settings > Account > Privacy > Blocked contacts screen, Tap the “blocked contact” for 2-3 seconds and you will be with the “Unblock WhatsApp contact” option. Important: Make it sure that your internet connection or Wifi Network has been turned to ON before implementing the above steps. You may get error message in case you are not connected to any working data connection. 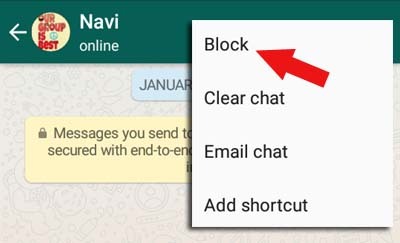 How to Block any Person / Contact on WhatsApp directly from the Message / Chat Window. 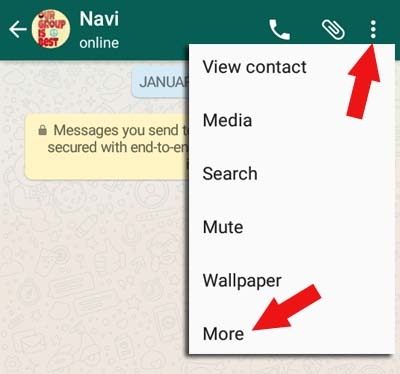 This actually is the easiest way to block anybody on WhatsApp within the CHAT window itself. In addition, there is no need of having that culprit WhatsApp contact in the phone’s contact book. Below are the complete demonstration to perform this act. 1)- Open your WhatsApp messaging app. 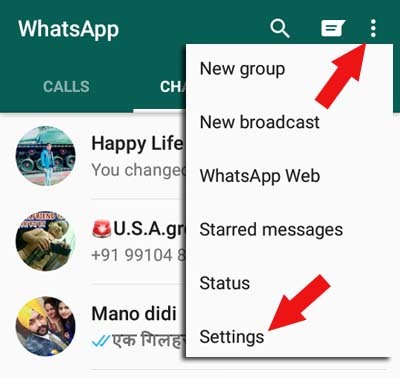 2)- Find the culprit WhatsApp contact from the CHATS or CONTACTS menu. Get into the Chat (message) Window (screen) of the person, you wish to block. 3)- Once you get into the Chat Screen of the culprit contact, Look for the “option menu” (3 vertical dots at top-right) and click to it. 4)- Now, hit more from the “option menu”. Here it come, the “Block” option. Simply Click or Tap to the “Block” option. 5)- Once you click the “Block” option, a confirmation message will appear. Confirm the Block process by clicking “Block” again in the confirmation window. Congratulations!, You had successfully blocked the offender WhatsApp contact within the message window itself. To unblock the person, If the Message window is available, follow all the above step. Just in the end, you will find the unblock option instead of the block option. If the Chat (message) window isn’t available, follow the steps explained in the first method, get onto the “Blocked contacts” screen, Tap & Hold any “blocked contact” for 2-3 seconds and the option to unblock that contact will be available to you. Isn’t that’s SIMPLE. Important: Active data connection is mandatory to perform all the above actions. You may get the error message if not connected to any working data network. Does the Blocked Person will know about this Block Process ?. What Actually happens when you block any WhatsApp contact ?. Prior to blocking anybody, there maybe many questions in your mind. Some of the frequently asked questions FAQ’s are below with the answers. Question 1- How will this blocking process effect the blocked WhatsApp user ?. Answer 1- Once you block any user on WhatsApp, the user will not be able to see your status message, last seen time-stamp and your profile picture. In addition, the user will not be allowed to send a message or make any call to you. Same rules apply for you too. But remember, If you both are the members of any common WhatsApp group, the blocked user can interact with you. Question 2- Can I send messages or make call to the blocked WhatsApp user ?. Answer 2- Actually this question has 2 answers, the first one is NO and the other one is YES 🙂 . Technically, you can’t send messages or make any calls to the blocked user. There is a small trick to do so, unblock the blocked person first, send the messages or make the calls, block him again if needed 🙂 . Question 3- Will the blocked person know that I have blocked him ?. Answer 3- Don’t worry, the blocked person will never be 100% sure about this blocking process implemented by you. WhatsApp doesn’t reveal this information openly as they cares for their user’s privacy. Although there are some indicating signal to Check If Somebody has Blocked You on WhatsApp. You may like: How to Check If Somebody has Blocked You on Facebook Chat. Question 4- What happen when the WhatsApp blocked user try to connect with me ?. Answer 4- Nothing special will happen, be relaxed Whatsapp cares for your privacy. When the blocked Whatsapp user try to send message to you, he will never get the double tick (check) mark in the message bubble, this means that the message will reach the WhatsApp server but not to you. When the blocked user try to call you, the ring will go normally at the WhatsApp server but you will not get the ring as well as the call. How to block any WhatsApp group ?. WhatsApp Groups is another great feature of this top performing messaging app, where we can discuss or transmit our messages to a group of peoples in seconds. The WhatsApp groups are also helpful to categorised our WhatsApp contacts. Anybody can create any number of WhatsApp groups following a very simple process. At present, only 256 member are allowed to participate in any group, in future the number is likely to increase for sure. Participation process in the WhatsApp group is very simple, the group owner (admin) can add anybody to their group, without their permission. If the member is not interested in the group anymore, there is a mute & exit option for the WhatsApp group members Sadly 🙁 , the Group admin has the power to add you again & again to the group, without any limits. Don’t you think, that’s irritating. Technically there is no permanent block option available for the WhatsApp group. Don’t worry, we had discovered our own working method to permanently block any WhatsApp group. Below is the way to block WhatsApp group. Simple trick to block WhatsApp Group Permanently. Actually in these circumstances, WhatsApp groups aren’t the Culprits. The real Culprits are the ADMIN’s of those WhatsApp groups, its only the group admins who are irritating us by adding again and again. Why not to block the group Admin first using any of the already explained method to block WhatsApp person or contact. Ha Ha, we know you gotit 🙂 . You can easily GRAB the group admin’s phone number by visiting the “group info” page. Prior to blocking the group admin, make it sure that the group admin’s phone number resides in your phone’s contacts book. After blocking the WhatsApp group admin, just exit (leave) the WhatsApp group. 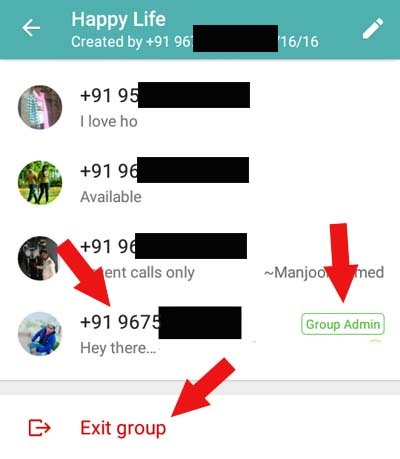 To exit (leave) any WhatsApp group, visit the same “group info” page by clicking the “Group Name” at top, now look for the “Exit Group” option at the bottom of the “group info” page. 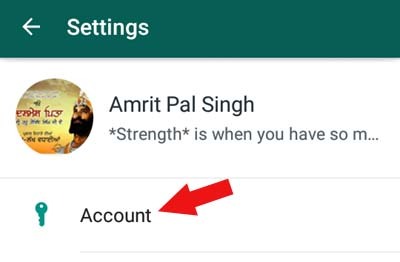 Important: If any WhatsApp Group has multiple (many) Admins, You have to block all of them separately. This completes the “How to block any WhatsApp group” section, We hope every doubt has been cleared now and you have liked our way to block WhatsApp Groups which were freely irritating you till now. You may also like: How to Use WhatsApp New, Hidden, Secret Font FixedSys. We don’t know what to write in this ending note, actually every word related to “Block WhatsApp Contact or Group” already written. Thats’s all for now. Please do share your opinion about this post under the comment section below. If any point related to the topic is incorrect or left, you can request us to correct or add the same. We will try our level’s best to update the post as earliest as possible. Thanks you very very much for being here and giving your precious time. Keep visiting a2z infomatics, we will be back with many more useful stuff like this very SHORTLY. God Bless Everybody.